My time management has changed as my business has evolved, especially since becoming a mom. 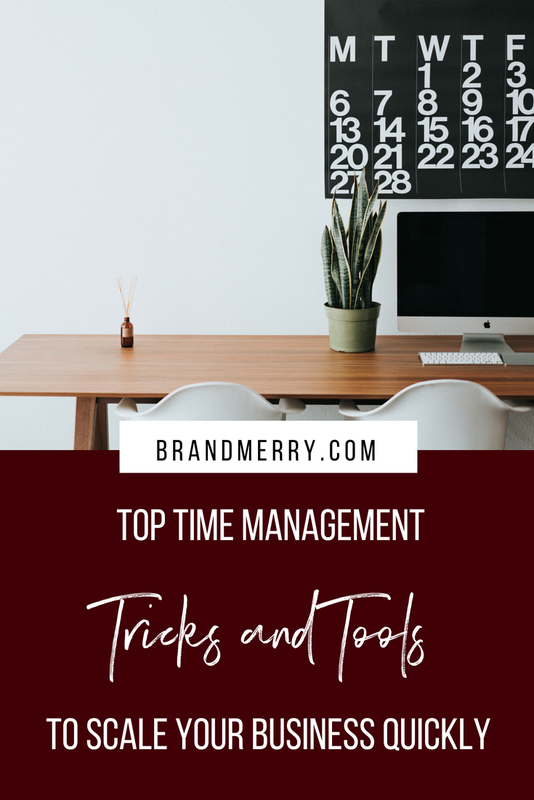 I'm excited to share with you different time management tricks and tools you can use throughout different phases of your business. I started my business in January of 2015, my son was just a month old, and I had a couple weeks left in my maternity leave from my 9-5. A big thing I learned right from the beginning was that I had to focus on what worked for me instead of trying to do all the things I was seeing other coaches and online business owners do. My two main focuses at this phase in my business were: growing my community and making sales. It was really about where to put my energy towards that would make the greatest impact. At this time, that meant showing up, nurturing my community and making sales. It's really important to set an intention early on about what my business was and make it a top priority. I really believed that this was it. This was my business, my source of income. I made the intention that I would have the time to focus on my business. Probably the biggest area of growth for me was once I left my 9-5. This was a very scary time in the Knight household. Monday and Friday became my new batch scheduling days, and the way I was able to do this was with help. I got 3 hours on Monday and 3 hours on Friday while my son got some great playtime with his grandma. I would write my emails and blog post for the weeks, and then create shorter social media posts from that long-form content. I would have the whole month planned on what I would talk about each week, so when I went to sit down for the week, I already knew what the topic would be. So Monday was batch scheduling, Tuesday and Wednesday's were client days, so I was even batch scheduling my coaching. Then on Friday's, I would take any loose end calls, discovery calls, etc. and do more creative type stuff. Other than that, I was working in 30 minute to hour increments. And how you do those is just to embrace them fully. However, I don't think I would have been able to grow to where I am today without having my batch days. In this phase, I made a big shift. I changed up my whole coaching schedule and started doing bi-weekly coaching. Which not only made my schedule more manageable but also made my clients more accountable. So I would have a coaching week, and then a creative week. This was a really great change for my business, and I still do this today. My biggest focus for this phase was doing activities that allowed me to make money and increasing my mindset routine, so I was able to gain clarity on where I would have the biggest impact. I also made mindset a top priority because I needed clarity on what's working and what's not working. I also introduced my Youtube at this time and batched that as well. Here we are today. This is the big one. At the beginning of 2018, I had a major shift in my business. One thing that had become really clear to me, is that my business had increased pretty quickly once I hit that six-figure mark, so I had to figure out how to sustain this and continue to grow. Time and energy are our most valuable resources, so if I wanted to make more money, I had to become really clear on how I was spending my time. My son is now two, and if you have a two-year-old, you understand. Now I'm planning, 90 days, 6 months, even a year into my business. Now that I have a bigger picture, I'm really able to streamline my business and time management. In addition to that, I had to take a hard look at how to free up time in my schedule. If you want to go to the next level you can't keep doing the same things. You have to do new things, so I really embraced hiring a team. I have to look at the big picture goal for my brand and business and ask myself "is this getting me closer to that?" Content creation and video were non-negotiables for me, so I still batch schedule these myself. The other thing was my visibility. My visibility has gone beyond my Facebook group and others Facebook groups. It's now Instagram, Pinterest, Podcasts, Summits, etc. Focus on the money making tasks, but also the things that get you really excited. What are those things that are non-negotiable for you? Once I became clear on those, I started outsourcing the other stuff. I did not outsource soon enough, and I know it's scary, trust me, I'm a recovering perfectionist, but it so worth it. Another thing I did, was really focus on areas that didn't take a ton of attention, like reply to comments, do emails, etc., I'm now able to do this with my son. My focus at this time is the big picture. Asking myself "Is what I'm doing now getting me closer to my big picture goal?" Also looking at where my energy goes and leaving behind what doesn’t serve me or outsourcing to a team for support. Embrace the changes as your business grows or your attention is needed elsewhere, so when you are working you can really focus. Voxer - I use this to send quick voice notes to clients, saving me time by not always writing emails and record memos for myself for social media posts and emails. #1 Tip for when you are feeling SUPER overwhelmed is to streamline and focus on one single thing! It allows your brain to slow down and once that once piece is accomplished you feel motivated and clear to keep taking action. Watch the video for a complete case study of how my time has changed as my business has grown and more detailed information on how I utilize my time and energy in my business.